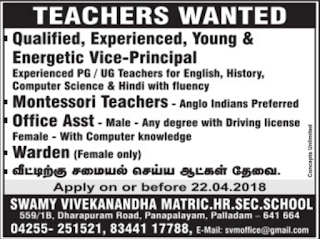 Swamy Vivekanandha Matric Higher Secondary School, Palladam has advertised in THE DINAMALAR newspaper for recruitment of Vice-Principal,Teaching/ Non Teaching Faculty jobs vacancies. Interested and eligible job aspirants are requested to apply on or before 22/04/18.Check out further more details below. About School: Swamy Vivekanandha Matriculation Higher Secondary School, Palladam.The school has made a significant contribution towards education excellence in the Palladam region. (a) Vice-Principal: Qualified,experienced young & energetic person. (c) Fluency in English&Hindi is Must. 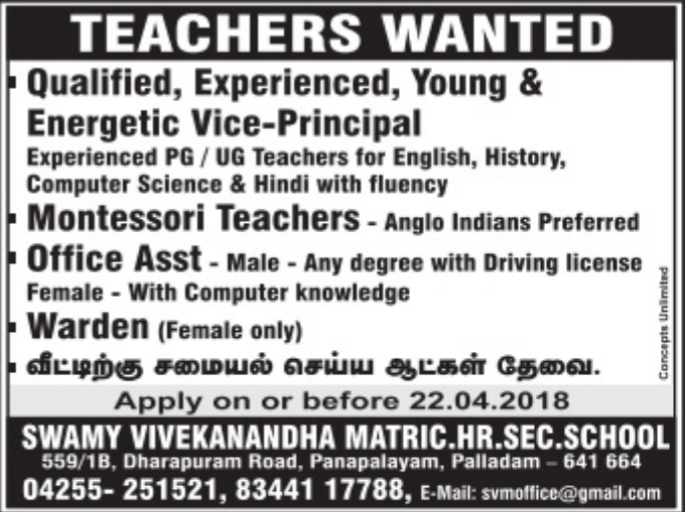 (d) Montessori Teachers: Anglo Indians Preferred. (e) Office Asst: Male- Any degree with Driving Licence, Female- with Computer Knowledge.